It can be trivial, it can be serious. It can be transactional and it can be relationship-driven. It can be tactical and also strategic. It can be external or internal. 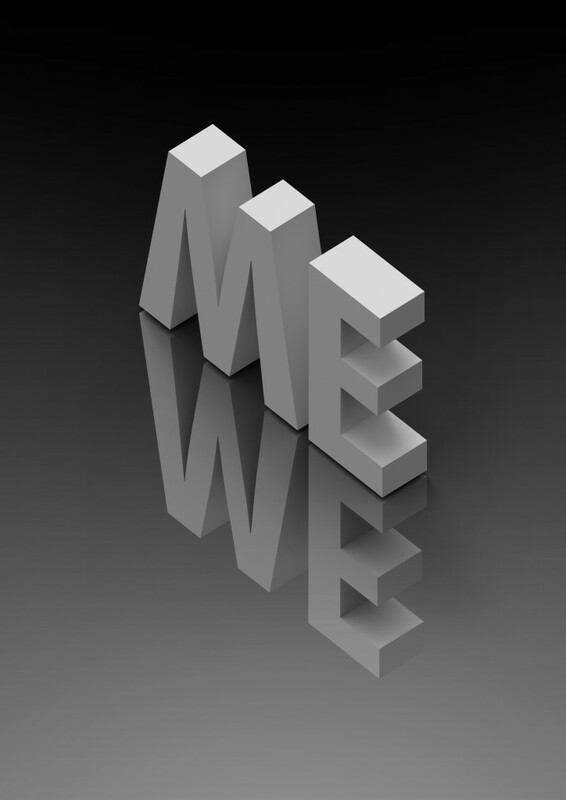 It relates to marketing – and also to management consultancy. So how do we describe the full scope of what we call public relations to those students whose life experience and imaginations may be limited to just one or two modes (usually the press office, content marketing and publicity functions)? Here’s a model that seems to me to describe these four modes. It’s based on the relative level of creativity and the relative level of value-added consultancy offered. It uses the existing division between marketing communication (‘marcom’) and corporate communication (‘corpcom’). 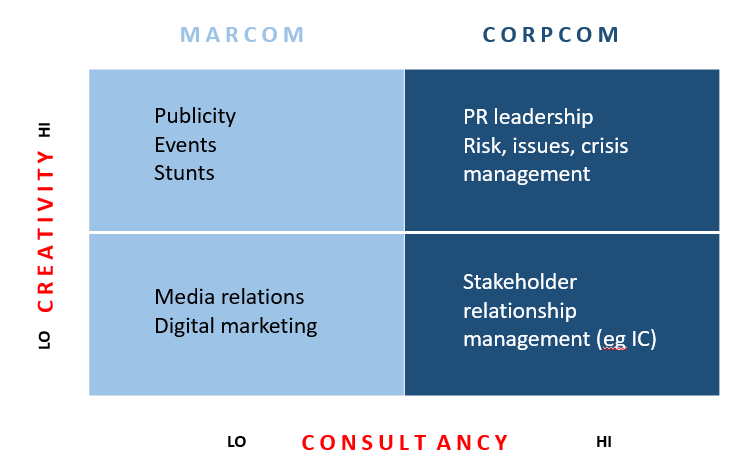 In this model, the ideal position is to be a highly creative consultant adding value to the client or organisation through strategic public relations leadership. The least value is offered by those transactional functions that are routine and less creative: these roles attract the lowest pay and are first in line to be automated. There are tensions, though. At one end, there is the continued encroachment of marketing into the domain of public relations (or some would say blurring of the boundaries between the two). At the other end, there is the question of whether public relations remains a distinctive management discipline, or whether it becomes a part of management consultancy. The recently-announced acquisition of risk and crisis management experts Regester Larkin by business advisory firm Deloitte is a significant development in this value-added space. Media selection used to be easy – a straight choice between editorial and advertising. It’s a more complex picture now. The world’s largest public relations firm – the one that remains independent of advertising agencies – is now talking up media partnerships in the form of sponsored content. It (Edelman) has appointed a new ‘head of sponsored content and media partnerships‘. Ian Burrell, writing in the Independent, thinks that the availability of new channels means that ‘the PR industry and its clients would rather reduce the press to the margins’. While ‘advertorials’ were always an unlovely (and unloved) hybrid, they’ve been given a boost under their newer name, ‘native advertising’. But Is native advertising really anything new? This world of sponsored content is widely known as content marketing. Yet read these 7 Tips for Effective Content Marketing and tell me how many are not the domain of (traditional) public relations? Number 6 perhaps – though even then the PR approach seems to me to be trumping blatant SEO. Content marketing may sound like a new concept to some, but Mark Schaefer argues in Content Shock: Why content marketing is not a sustainable strategy that the boom is already over and it will become increasingly ineffective and uneconomic. And there are still some voices speaking up for these traditional PR approaches. Alex Singleton has a new book out called The PR Masterclass. He argues in a blog post for PR to be done better rather than to be radically rethought. Stephen Waddington is a moderniser envisaging a future for public relations beyond media relations. Yet his 10 areas of work in progress for public relations opens with an acknowledgment that it’s hard to change traditional workflows. Back to earth. Back to reality. There's a feeling of 'back to school' this week. But that's not the reason for the jolt. The reality check is the decision to fold the Media Guardian supplement (and Education and Society supplements too) into the main paper. Clearly, this is a commercially-driven decision taken because of the migration of job advertisements from print to online (and elsewhere). Decades ago, before the world of the web, each Monday's Media Guardian had page after page of job ads and was the place to find a whole range of graduate opportunities. Times change, and so does technology. The second jolt relates to this first one. Here's a very lucid perspective on the issue of unpaid internships from an MSc Marketing student. The phrase that leaps out at me is this uncontentious-looking one: 'I’m 23 and aspire to a career in advertising'. Only connect. The Guardian loses its well-established Media supplement because of the migration of classified ads online. Then ask some questions about the future of display ads and print media. Hopefully smart graduates are alert to this. Hopefully their lecturers and textbook authors are too. But I very much doubt that university marketing and management teams are when they offer courses that appear to promise glittering careers in glamorous twentieth-century industries that evoke a Mad Men world. Marketing consultant Martin Thomas was co-author of Crowd Surfing, one of my favourite books in 2008. When I saw the new book's contents page containing such chapters as 'Not a place for tidy minds' and 'The end of planning?' I knew I was in for a treat. In follow up to Crowd Surfing and Clay Shirky's Here Comes Everybody (my top pick from 2008), this feels like a radical manifesto. It's certainly a challenge to the micro-managers, the planners and brand consultants whose traditional role has been to offer predictability and certainty. We live in a complex, non-linear world – and the challenge is how to 'embrace the chaos and ambiguity of modern life'. Simple prescriptions obviously won't do, though the author does offer some broad guiding principles for successful loose organisations (on page 168). He also gives many case studies to show where loose principles prevailed (ASDA, Pret a Manger, First Direct and Unilever among them). Thomas writes well of the millennial generation who 'take great pleasure in subverting any attempts by authority figures to silence them.' But I should say that I'm more likely to be criticised by my students for teaching in too 'loose' a way by those who want me to give them much more precise instructions ('just tell me what you want me to do'). The author is an articulate and well-read guide. Though it's a business book and not an academic text, he frequently makes me feel inadequate by his erudition. While there's nothing I can disagree with the in the book's premise, it's not an original idea. I'm surprised the author makes no reference to open source, whose concepts have already been taken beyond software development into politics and marketing. And a book that makes an even more compelling case for creativity and innovation in business is Charles Leadbeater's We Think (not cited here). But it's an enjoyable and valuable read and the challenge for many will be to learn the lessons and put them into practice.